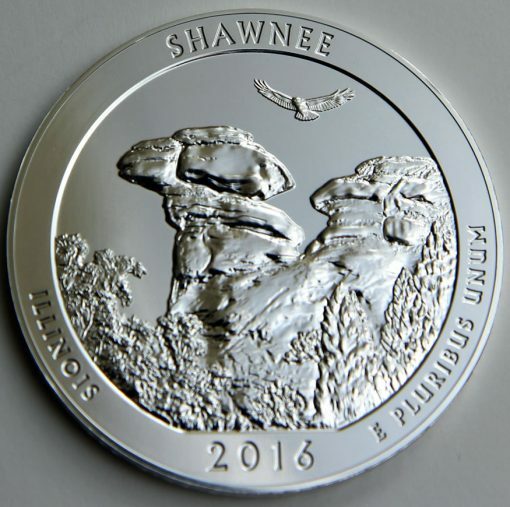 Shawnee National Forest makes another appearance on a United States Mint product with today’s release of a 3-inch, 5-ounce silver coin depicting a design emblematic of the site in Illinois. 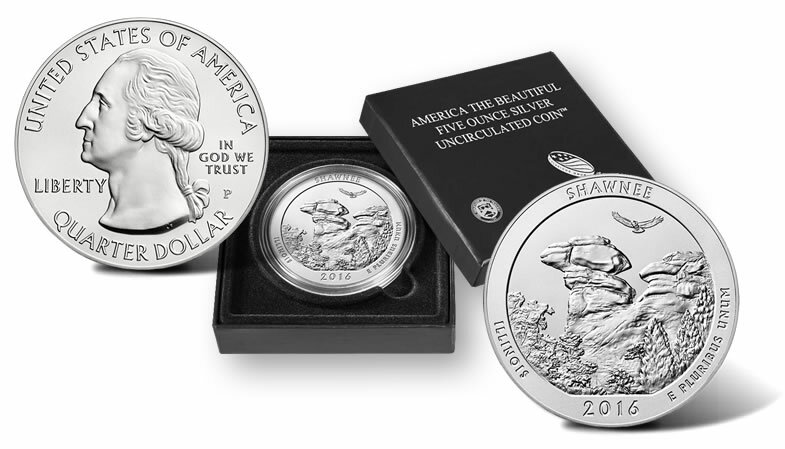 This newest release is the 31st overall in the U.S. Mint’s collector series of America the Beautiful Five Ounce Silver Uncirculated Coins. It is the first of five for 2016. Located in the Ozark and Shawnee Hills of Southern Illinois, Shawnee National Forest preserves about 280,000 acres of federally managed lands. In its early years, many of those acres included exhausted farmlands. President Franklin D. Roosevelt designated the lands as an official national forest in 1939, with a number of conservation and reforestation projects since then responsible for restoring the land to its current state. 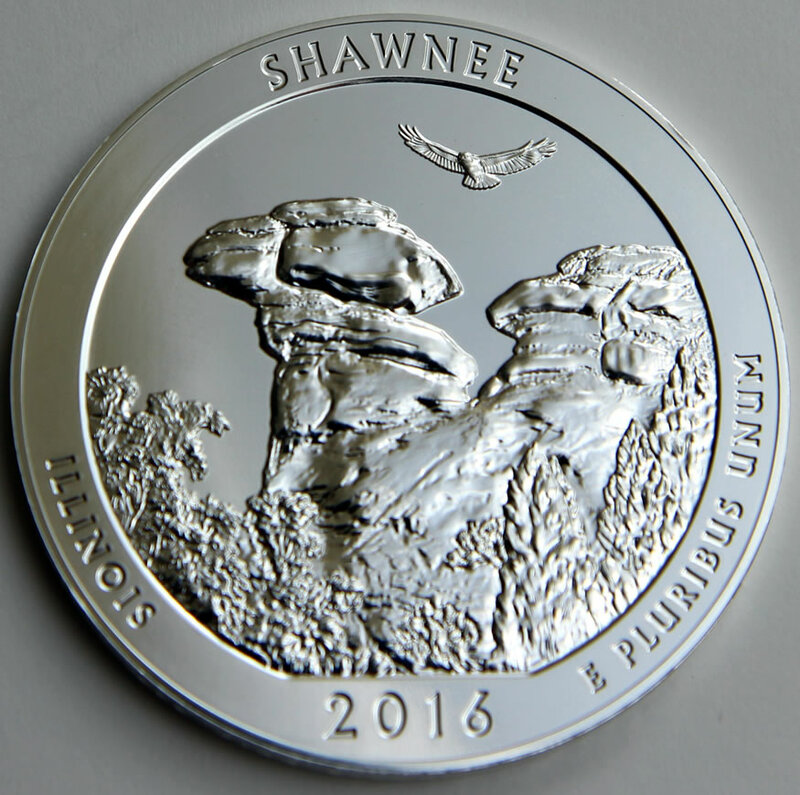 Designs on this collector coin from the Philadelphia Mint match those of the smaller Shawnee quarter, which launched into circulation earlier this month with large quantities of them now available in U.S. Mint-branded rolls and bags. Designed by Justin Kunz and sculpted by Jim Licaretz, the reverse depicts a close view of Camel Rock with natural vegetation in the foreground and a red-tailed hawk soaring in the sky overhead. The other side, like every America the Beautiful Quarter and companion silver 5-ounce coin, shows John Flanagan’s effigy of George Washington. Edges of the 3-inch silver coins are unique. 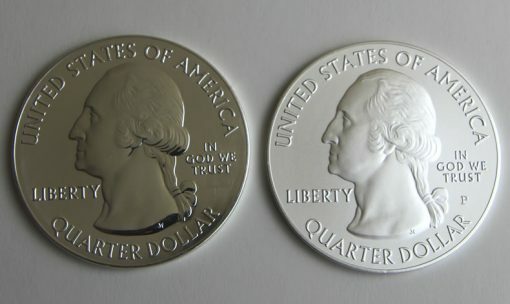 Instead of the reeded treatment found on quarters, they are flat and incused with ".999 FINE SILVER 5.0 OUNCE." See how five ounce coins are made. Pricing for the new coin is $149.95. With its 99.9% pure silver composition and at $15.16 an ounce, it has a melt value of $75.80, bringing its U.S. Mint premium per ounce to $14.83. That is low when compared against other collector silver coins from the Mint, but toward the upper end for recent 5-ounce issues. Last year’s 2015-dated coins opened with per ounce premiums of $16.06; $14.38; $14.38; $13.67; and $13.80 while the 2014-dated coins came in at $15.71; $12.35; $11.60; $11.33; and $11.18. 2016-P Shawnee National Forest Five Ounce Silver Uncirculated Coins are available from the U.S. Mint via this online product page or by calling 1-800-USA-MINT (872-6468). Mintages ramped higher this year. Last year, maximum sales per design for the bigger coins were established at a combined 65,000. In 2016, the number is set at 150,000 coins with 30,000 for this uncirculated release and the remaining for the companion bullion version. The U.S. Mint reserves the right to tweak the mintages based on demand levels. The Philadelphia Mint also produces 5-ounce bullion versions for investors. 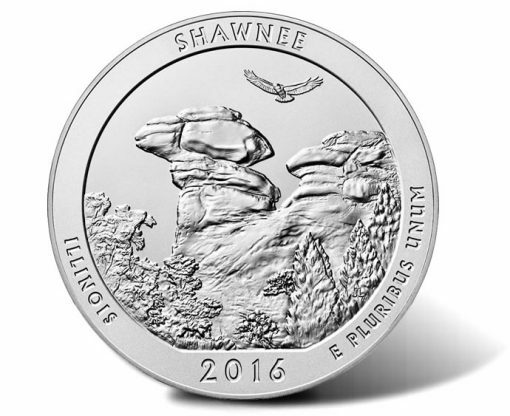 The 2016 Shawnee Five Ounce Silver Bullion Coin went on sale Feb. 1, and 41,800 were claimed by the end of the day. Its sales as of Wednesday, Feb. 24, stand at 102,500 coins, the most since the release in 2011 commemorating Olympic National Park in Washington. do not ship in special U.S. Mint packaging. 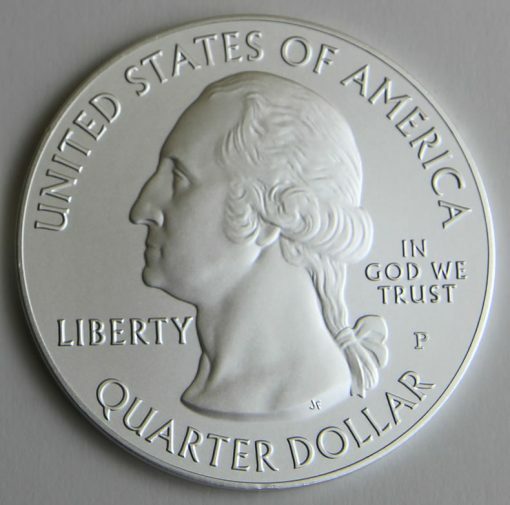 The U.S. Mint reserves the selling of 5-ounce bullion coins to authorized distributors who buy them in bulk at $9.75 per coin plus silver spot. They are normally available from precious metals and coin dealers for a few dollars per ounce over their melt value. I subscribe for the 5 oz. collector coins and I got an email from the US Mint this morning at 12:47 AM ET saying that my order for this product was received. It contained a confirmation number. That’s over 11 hours before it went on sale. Did anyone else who subscribes for this product get a similar email? I wonder what the new montage # will do to the market. It is like doubled @ 75,ooo units. 2016 on will not have the lower mintages of all the prior ones. As this article states & per the Mint’s press release about a week ago, the expected mintage of the “P” Mint mark version 2016 5-oz silver ATB coins is only 30,000 at the most. Still a low mintage coin! The U.S. Mint reserves the right to tweak the mintages based on demand levels. Hello I dont understand how the mint sells the 5 ounce bullion coin to authorized distributors for $9.75 per coin plus spot. Is it 9.75 a ounce plus spot for each ounce up to 5 ounces ? thank you. Believe it or not, but the U.S. Mint has an official list of only 13 companies in the world who are registered & approved to purchase the Mint’s silver, gold & platinum bullion version coins. The APs pay only $2 per coin plus spot price of silver for the 1-oz silver American Eagle bullion version $1 coins & pay only $9.75 per coin (not per ounce) plus spot price of silver for the 5-ounce ATB silver quarter dollar bullion version coins. It is an unbelievable monopoly the U.S. government gives these 13 companies! I am republishing my post from February 22 of those 13 companies here on this CoinNews coin blog website under the precious metals report published on this website today Saturday February 27. Happy bullion coin collecting/investing Tim! Seth, thank you very much for the info. I am so addicted to coin and bullion collecting that every bit of info that I learn helps. Thanks again. You are very welcome Sir. I have been involved in all aspects of the numismatic hobby/industry/science for 40 years now (collector, part-time dealer in college, investor, researcher/journalist) & I enjoy sharing information & learning from others here. “It takes a village” as the old saying goes. We share a common interest & I will attempt to answer any numismatic questions or refer you to a book or someone or some collector specialist group that can get the answers.